GESD is currently working on scale-up of the technology and an in-field evaluation of the energy storage unit with Stony Brook University. The GESD-SBU team demonstrated design and implementation of a sealed high-voltage EDLCs energy storage unit. The unit is internally balanced, there is no need for an external circuit. The electrode is very cost-effective nano-carbon composite either of a commercial carbon or of graphene platelets with carbon nanotubes. The nano-carbon electrode materials were used for deposition and assembly of a working prototype of an internally balanced high-voltage energy storage unit. The bench-top prototype unit, tested up to 10 V, exhibited good discharge characteristics and charge retention. This development enables new compact energy storage solutions for grid and vehicular applications.A. Paul Gill, CEO Lomiko Technologies, stated that "New smart phones and electric vehicles do not need new batteries. They need high-density energy storage supercapacitors that provide 10 times the energy in the same size package. New device power requirements will quickly outstrip the current battery designs and the materials used in them," "There is a buzz about lithium because people are talking about supplying materials for current designs such as the Lithium-ion battery. 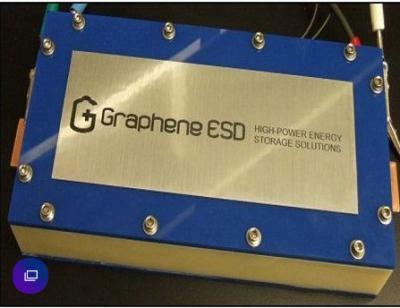 Graphene ESD sets out in a different direction. It is focused on making a better energy storage device."